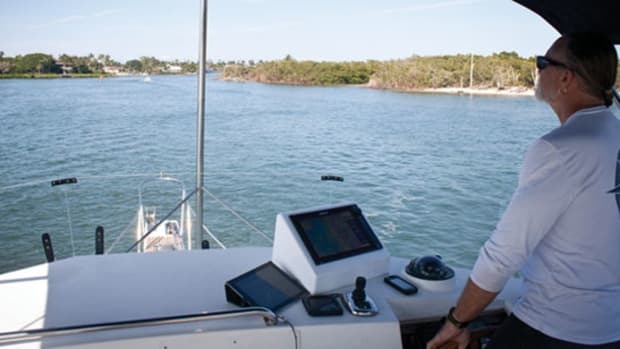 Simrad adds the radar technology it developed for recreational boats to a system for ships and megayachts. Trickle down” became a phrase tied to economics in the 1980s, but less commonly it’s an illustrative term to discuss technology. Generally speaking, it describes how new developments spread from low-volume, high-price niches to high-volume, low-price mass markets. GPS is the classic example from an apparently endless list of devices that have made their way from space research or the military through commercial applications to become everyday gadgets. It’s much harder to find anything that has “trickled up.” That makes Simrad’s Argus radar a rare breed: It’s a commercially approved radar that includes the Frequency Modulated Continuous Wave (FMCW) technology that Simrad first introduced in its 18-inch BR24 radar for small craft back in 2008. Argus systems start at $19,250 and include a six-foot 12kW antenna, core unit, ARPA, AIS, and interswitch. International Maritime Organization (IMO) approval doesn’t come easily: A radar must meet a long list of performance requirements and features. It must, for instance, be able to detect a 5,000-ton ship at 11 miles or a 33-foot boat at 3.4 miles. At the other extreme, it must also display a target just 131 feet (40 meters) away, and it must separate two targets that are only 2.5 degrees apart. There isn’t much that the IMO hasn’t thought of. It specifies which functions have to be available by single knob manipulations or button presses, the symbols that must be used to identify ARPA and AIS targets, and even what shade of blue counts as blue. The size of the display varies depending on the size of the ship it’s on but for a ship of 10,000 tons or more the radar picture has to be at least 12.6 inches (320 millimeters) in diameter on a screen at least 13.4 inches square (340 millimeters). 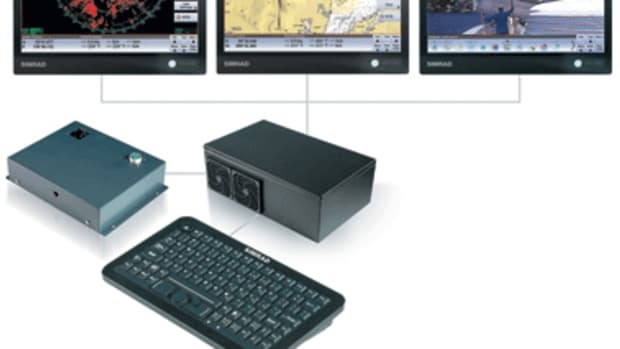 But as Tim Ryder, director of Simrad Professional Series, explained, the latest rule revision allows the radar and its monitor to be approved separately rather than as a single package and also the use of a widescreen monitor. The height of the 13.4-inch IMO box calls for a 27-inch widescreen monitor but leaves ten inches of width to spare. “And that means that we can do other things outside the regulation box,” Ryder says. 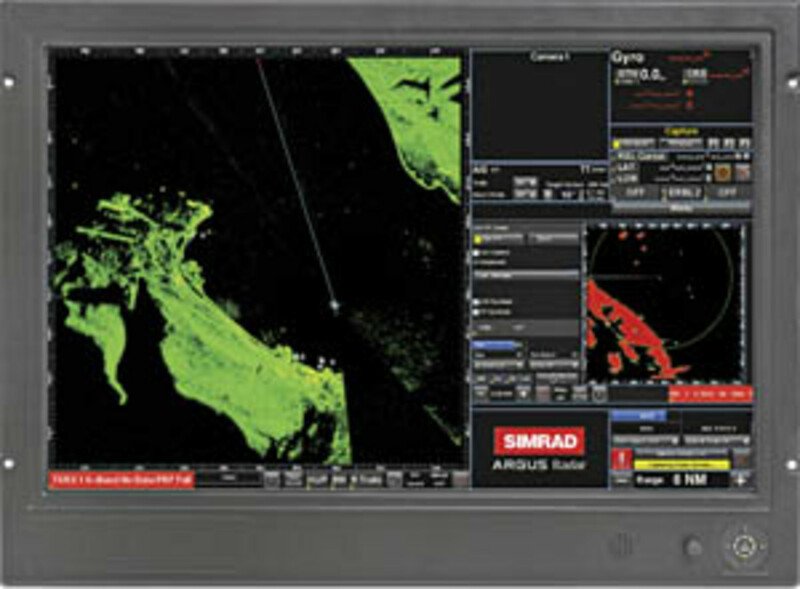 In particular the side panel can display the picture produced by Simrad’s 3G broadband radar. The 3G is not IMO-approved so it can’t take the place of the main radar image in the IMO box. 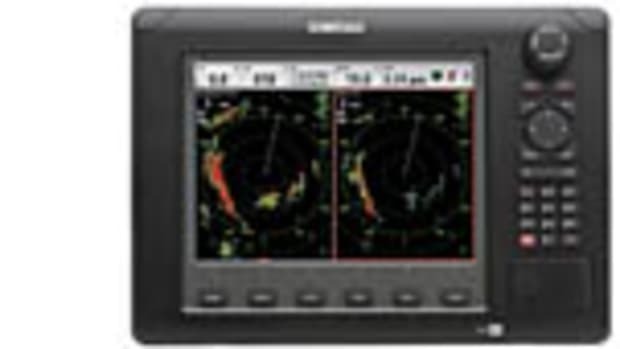 But remember that the monitor in our photo is 27 inches across the diagonal so even the “small” picture is about the same size as a full-screen image on Simrad’s NSS8 recreational multifunction display (MFD). The Argus black-box processor can run four open-array X- or S-band scanners (of up to 12 feet and 25kW) and two 3G radars with dual-receiver circuitry, which means it can mix and match the pictures from many radar sources. So it can combine the images from two radars to fill in blind sectors, giving 360-degree coverage regardless of obstructions such as superstructure. Or it can compare two radars and only display things that appear on both. A target would appear in the same place on both pictures but sea clutter wouldn’t, so the clutter would be suppressed, allowing real targets to stand out. One problem of big radars mounted high up is that they can’t see close-range targets—a small boat 400 yards from a big ship could be literally “under the radar.” Adding broadband scanners mounted low on the bow and stern fills in that ultra-short-range blind spot. The headline-grabbing application of this is as an anti-piracy tool, though it could also be used in close-quarters maneuvering or with the added optional software for navigation in ice or other challenging situations. For smaller craft, Simrad has offered FMCW as a substitute for the more common pulse radar rather than as a supplement to it. Although the performance of the original BR24 was awesome at ultra-short range, it was offset by disappointing performance with small or weak targets at medium and long range. The company took a big step last year with the introduction of the more powerful dome it called 3G and has now followed that with the 4G. The 4G is based on the same technology as the BR24 and the 3G and retains all of their advantages—instant switch on, easier setup, stunning range resolution, and a minimum range of virtually zero—but takes frequency-modulated radar several steps further. 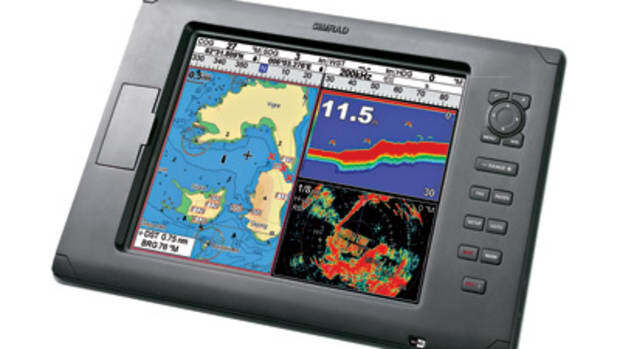 Simrad 4G radar sells for $2,299. Like the 3G, its nominal transmitted power is just 165 milliwatts—65 percent more than the original BR24 but still less than a tenth of a cell phone and less than one-10,000th of the smallest conventional radar. The 3G had 30 percent more range than the BR24. 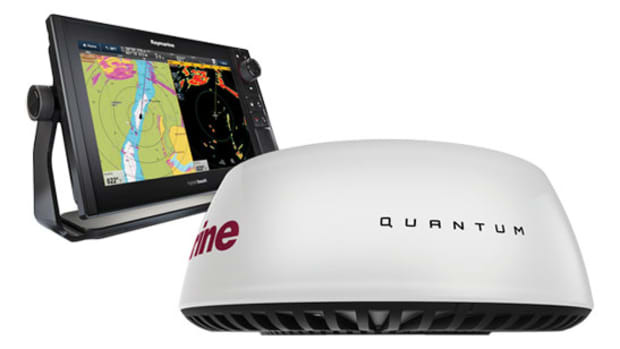 Now Simrad’s engineers have improved its signal-to-noise ratio for a further 50-percent increase in the range at which targets are likely detected up to a nominal maximum of 36 miles. 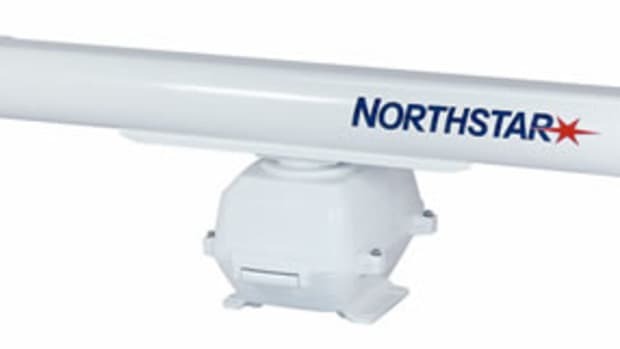 Combined with an NSE, NSO, or NSS display, the 4G boasts several features including the ability to operate as two separate radars at once with different processing applied to each half of the split screen. So you can look at the 36-mile picture on one side of the screen while the other half is zoomed right in to 200 feet; you can have ten MARPA targets displayed on one side, and a different ten on the other; or split each half in half and apply the radar as a chart overlay in one quarter while watching the unadulterated radar image in another quarter and having the same combination but at a different scale on the other half. But the best bit is a new function called “beam sharpening,” which produces such target separation as you’d expect of an open-scanner radar twice its size. 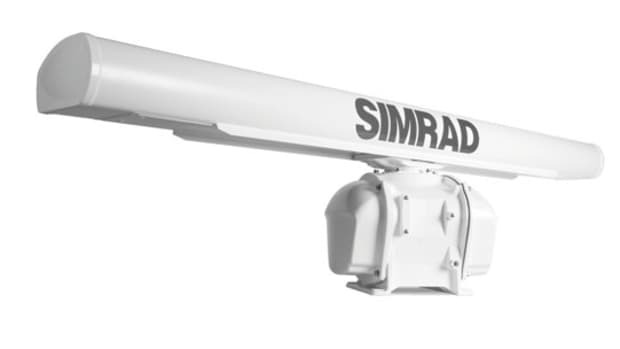 Simrad isn’t claiming to have defeated the law of physics that ties a radar’s beamwidth to its frequency and antenna size. 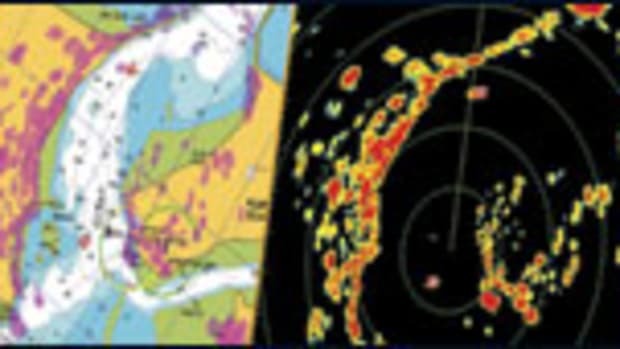 Nor is it using the kinds of tricks that human operators use to tweak the discrimination of traditional radar such as increasing the rain clutter control while reducing the gain. 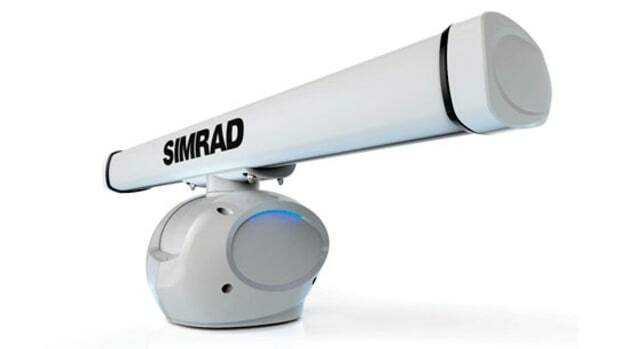 Simrad applied the same technology to both ends of the marine-radar market. The next challenge for us? To predict in which direction technology will trickle next. This article originally appeared in the February 2012 issue of Power & Motoryacht magazine.